Chicago is a city full of ambitious imbibers, and one look at the city’s explosive coffee scene proves it. Check out any one of these top-notch Windy City coffee joints for a taste of the best coffee in Chicago. Former Navy vet Kevin Ashtari got his start roasting coffee on a tricked-out grill in his backyard. Today Ashtari roasts beans on a 12-kilo roaster and brews them via espresso and pour-over at his Lakeview café to plenty of well-deserved fanfare. Co-owner Belinda Lipscomb makes everyone feel like a regular at her welcoming Hyde Park café, and with stellar pastries and Intelligentsia espresso drinks, you might soon become a regular too. Coffee any way you like it seems to the the motto of this beautiful Wicker Park café. Espresso, syphon, Chemex, Eva Solo, pourover—whichever brewing method you’re in the mood for, Cafféstreets has you covered. And if you’re needing to hone your own brewing technique at home, Cafféstreets even offers classes that teach you how to make coffee like a pro. Located in Chicago’s Ravenswood neighborhood, Ch’ava is one of the few indie cafés around the country where you can still find Clover-brewed coffee, and they do it right with a rotating selection of single-origin coffees from Intelligentsia, plus a nice menu of seasonal salads, soups and sandwiches. This Lincoln Park café serves a rotating menu of loose-leaf teas and specialty coffees from the likes of Metropolis, Counter Culture and Alterra, plus a great selection of locally made pastries. Grab a cup of Cafe Solo-brewed Intelligentsia at this good-looking café in Chicago’s Andersonville neighborhood. Baristas are at the top of their game, but they keep things real with a friendly, easy-going vibe. If you aren’t already familiar with Intelligentsia (pictured above), it’s time to find the location nearest you. Founded in 1995 by Doug Zell and Emily Mange, Intelligentsia introduced Chicago to craft coffee, and in the 16 years since, the company has kept its hold at the top of the specialty coffee pyramid, even expanding with an additional roastery and cafés in Southern California. 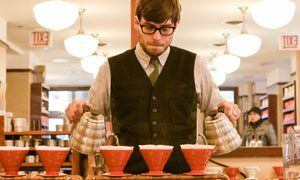 With a roasting facility and three retail cafés in Chicago, plus numerous local coffee shops carrying their coffees and blends, you have countless opportunities to caffeinate intelligently. This homey Bucktown café roasts its own coffee for traditional espresso drinks as well as unconventional (but equally delicious) options, like their namesake latte with coconut and dairy milk, honey, and a pinch of cayenne, and the Nutella mocha steamed with a dollop of the chocolate-hazelnut spread. Stick around for lunch and order one of the literary-themed sammies, like the F. Scott Fitzgerald with tomato and munster, or the Garrison Keillor with turkey, apple and avocado. Thanks to Istria’s location next to the Hyde Park Art Center, you can get your art and coffee fix at the same time. Mosey up to the pour-over coffee station for a cup of fresh-brewed Intelligentsia, choose from a dozen specialty teas or satisfy your sweet tooth with some housemade gelato. Just off the brown-line Belmont stop and kitty-corner to a Starbucks, this Lakeview café invites you to park it for a while with espresso drinks made from Metropolis beans and dreamy pies made by local baker Hoosier Mama. Metropolis is a coffee wunderkind. Founded by father-and-son team Jeff and Tony Dreyfuss (a geeky love of coffee runs in the family) in 2001, Metropolis quickly rose to become one of the most reputable roasters in Chicago and beyond for their exquisite attention to detail, from sourcing to roasting to brewing. In the mood for a Turkish coffee? Then head to this cozy Lakeview coffeehouse where they brew up the Eastern European staple alongside espresso drinks made with Metropolis beans and teas from an assortment of excellent vendors like Teavana and Wiseman. Pass through the lime green front door and enter Sip—your caffeinated sanctuary in the big city, complete with Intelligentsia beans, charming decor and a spacious outdoor garden in the back. What looks like any old dive bar from the outside is actually an all-organic coffee roastery and café in Chicago’s burgeoning Ukrainian Village. They brew their beans via espresso, pour-over and press pot, but if you’re planning on staying for a while (and why wouldn’t you? ), opt for the bottomless cup—at $3.50, it might be the best coffee deal in town. Looking for the Wormhole in Wicker Park? When you spy the real-life DeLorean in the window, you’ve arrived. An homage to all-things ’80s (think Gremlins, Ghostbusters and Nintendo), the Wormhole also gets in touch with the present by pouring perfect espresso drinks with beans from Metropolis as well as a rotating selection from specialty roasters around the country. Coffee liqueurs have come a long way. From Italian-style liqueurs to craft-distilled bottlings made with locally roasted beans, find out which brands to seek out and how to use them in cocktails.